LEGO bricks are famous for a reason, mainly, because you can build anything with them. There have been cases of cars and even houses made with LEGO — so it’s no surprise there are musical instruments as well. Many MOCs are just replicas of the real thing, but it comes to no surprise there are people who managed to build full-sized musical instruments. Let’s check some of these MOCs out. 800 bricks, a Carvin neck and an EMG pickup, and you’ve got yourself a fully functional LEGO bass guitar. YouTube user oldsoundz shows how it’s possible, and plays it too, for the complete experience. The whole piece doesn’t come cheap — around $1000 spent in LEGO pieces alone! Still, it’s a feat of LEGO engineering and well worth a look (and listen). 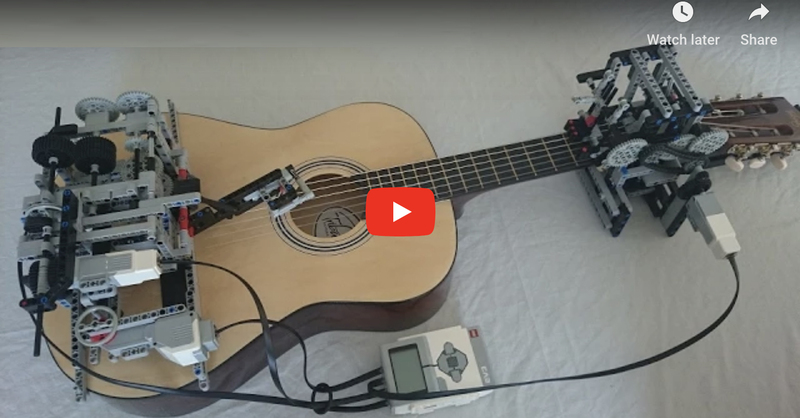 In his channel, oldsoundz also shows a fully-functional LEGO guitar. Veteran builder Henry Lim is famous for his art and sculptures made of LEGO bricks (especially dinosaurs and portraits), and the harpsichord is arguably one of his greatest accomplishments. Made with a staggering 100,000 pieces, the harpsichord is fully functional and plays just like the real thing (if with a slight undertone of LEGO). It isn’t just the sound, as the creator took care to make it look like the real thing as well: it can be tuned and has a lid just like a real harpsichord. You can see how he accomplished this on his official website (http://www.henrylim.org/Harpsichord.html). Much like the harpsichord, the piano is not an easy instrument to build. This certainly hasn’t stopped Jeroen Van Veen from building one — full scale and fully functional, of course. Almost 30,000 pieces make up this magnificent and realistic instrument. Inside, though, it’s a digital piano — although it does have acoustic features and none of the pieces is glued together, so there’s that. You can see more about the LEGO piano on the official website (http://legopiano.com/index.html). Nathan Sawaya is an incredible LEGO artists who’s shown his work all around the world, including art museums. It’s no surprise, then, that he’d pull off something like a full-scale LEGO violoncello — complete with strings. More surprising, he made this beautiful, realistic instrument that’s full of curves using only square and rectangular bricks, because why not? Surprisingly, Sawaya claims the cello is playable, although it sounds different — as it would, considering real cellos are made of wood, not plastic. Unfortunately, that does not seem to be the case. Although it does have strings, it isn’t really playable. Daniele Benedettelli is a master builder with an emphasis on mechanisms and robotics, so it’s no surprise that he created a LEGO glockenspiel-playing automaton. This fantastic creation can play different tunes and it’s entirely analog — no software needed. Just turn the crank and you have yourself sweet tunes played by a miniature classical composer, right at your fingertips. Okay, so a Guitar Hero controller isn’t exactly a musical instrument. Still, it’s an impressive achievement, especially considering it actually works as expected. The innards are from a real Guitar Hero controller, but the outside is modelled after a Gibson guitar. This, of course, makes it much cooler than the controllers we’re used to, but it’s also convenient, considering it’s also bigger than a regular controller — so, with some glue, everyone wins! Oh, and he also made one modelled after a Fender. Oh yes. There are lots of musical instruments made of LEGO out there (some functional, some not), but what about something that plays an instrument. Well, there is one. It comes down to two robots (one for each hand), cleverly coordinated and made with MINDSTORMS EV3. While there are some timing issues, and of course the robotic sound undertone (from the moving parts), it’s a true accomplishment of programming and building skills. These are only some of the cool things you can build with LEGO regarding music. Beyond guitar-playing robots and instruments, there are several miniatures, automata and music boxes out there. Everything’s possible — just takes a couple bricks and creativity.